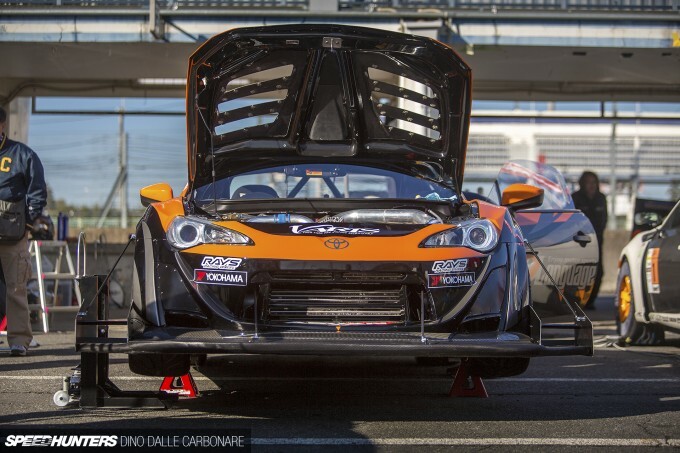 My final spotlight from the Rev Speed Super Battle is another DLanguage car, this time its Toyota 86 project. To me, this is another great example of what high-end Japanese performance tuning is all about. The ZN6 couldn’t have come around at a better time; Toyota doing what Nissan kept twiddling its fingers about by coming out with an affordable sports car for the masses. I’ll never forget the first Tokyo Auto Salon after the car’s launch – literally every performance shop and parts manufacturer had bought one and developed components for it. DLanguage got in on the act too, and after a couple of year’s worth of R&D, this is what the Tokyo-based tuner has to show for itself. Like all of DLanguage’s cars, the aero package was built in collaboration with Varis, which on top of supplying a few pieces from its regular line up of exterior upgrades, came up with some pretty wild front and rear solutions. Check out that front splitter for example, it protrudes a good 30cm-plus from the 86s front panel. 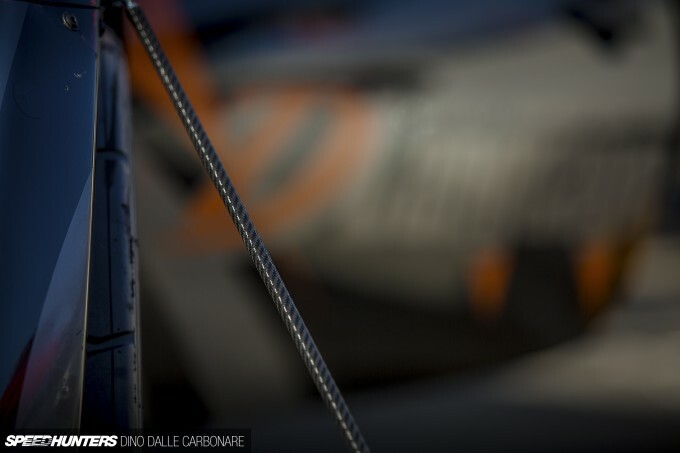 Of course, it’s constructed from carbon fiber, as are the four small support bars that anchor the splitter directly onto the chassis. Like the DLanguage STI R205 I showed you last week, the 86’s rear is dominated by massive extractors that help channel underbody air-flow out smoothly after it’s done its downforce-generating job under the car. 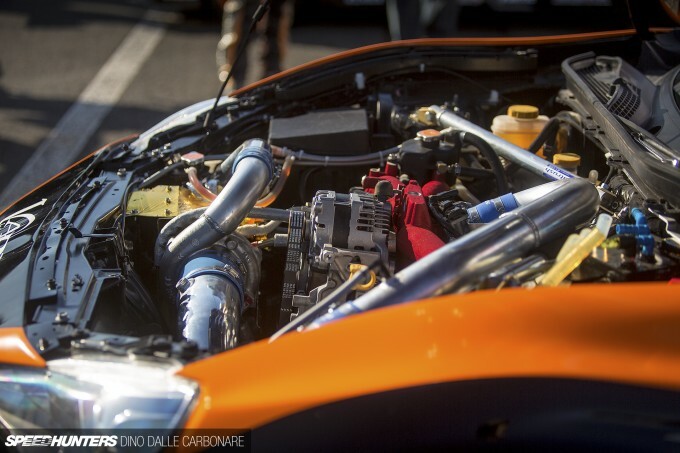 The 86’s 4U-GSE/FA20 is a decent enough engine with basic mods, and as some other tuners have proved it can actually by pushed to achieve pretty big power figures. But reliably isn’t its strong point, nor is the overly complicated use of both direct and regular fuel injection which just ends up creating unnecessary headaches. So, to get around all that DLanguage swapped over to an EJ25 engine that’s since been stroked to 2.6L and equipped with a big turbo. The built motor is both powerful and reliable. Mated to a sequential gearbox, the 86 seemed to rocket out of all corners at Tsukuba Circuit, and really packs on the speed around the bigger turns. The cockpit is strictly business, the stripped cabin having been brought down to the bare essentials, which include a pair of sway bar adjusters and a brake bias knob. 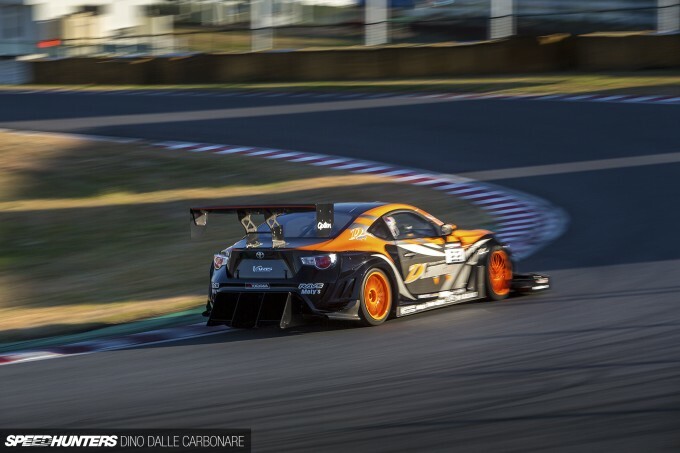 To counterbalance the weight of the driver, the fuel cell has event been mounted diagonally across the seat, completing what is one of the most highly-modified 86s currently competing in Japanese time attack. I hope you’ve enjoyed my from the 2015 Rev Speed Super Battle. Hit the link below to revisit them all! beautiful. absolutely beautiful. I'm really loving the canard and diffuser set up. Anyone know the time it got on Tsukuba? I'm curious. Livery is awesome. Esp the eyeliner below the headlights! Dino I do like the description of how the diffuser works, a lot of people think the diffuser on it's own is there to make downforce, but you hit the nail on the head that the primary function is to extract the floor flow... Good job getting the technical detail in there! 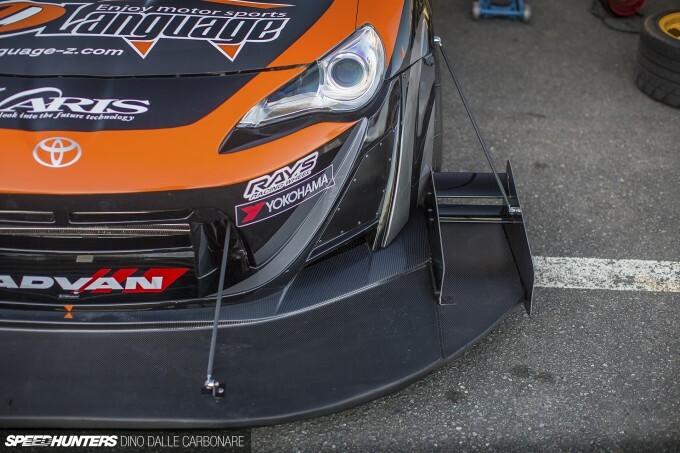 As a side note, if you ever get invited to go to some of a time attack team's development testing I'd love to see a bit more of his they do their R&D, especially on the aero side of things. A story of how a top team goes about the process of concept, manufacture and testing would be awesome.. Bit sad to see tuners not coming to grips with FA20, and reverting to ancient designs. It's probably difficult to get an aftermarket ECU that runs the direct and port injectors together. Any clues as to what engine management this car uses? 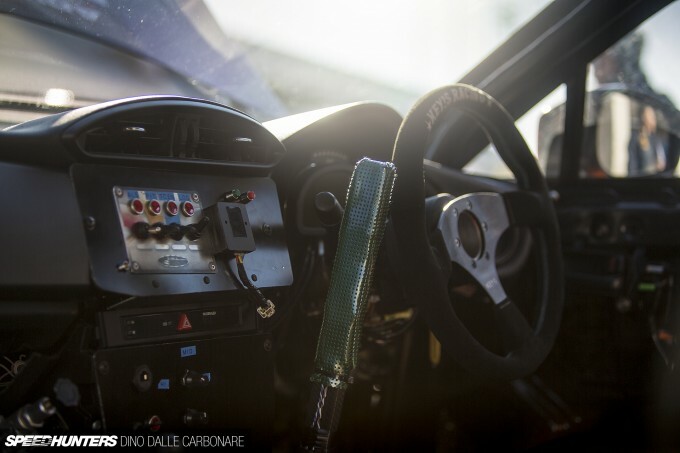 speedhunters_dino KRaZyAmmo Where I can find whole list event lap times? Unfortunately i view it as another let down. I got super excited to see an 86 time attack car but... I agree that the fa20 has an extreme amount of potential. And there are no tuning issues with direct injection as someone tried to bring up. Also the aero is meh at best. It's decent as far as time attack cars go. But other than a few Andrew brilliant cars in the past it's not seemingly fully right. But I am an aerodynamicist with the knowledge not the money. (Masters in aero with a bs in mechanical). I know I sound like a stickler. 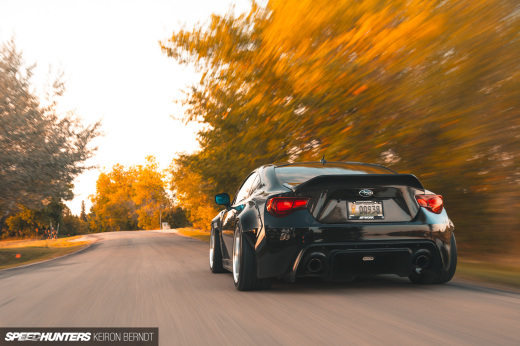 But as a new owner of a brz I've looked into the potential of the platform. Fa20 is great. And can be a good platform for aero. Only wish suspension was double a-arm f/r. 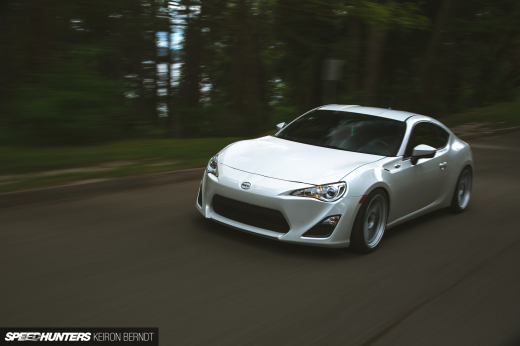 It is still one of the best 86's I've seen but feel it needs just a tiny bit more to be really great. These are just my opinions. If anyone just wants to have an adult conversation about it I'm down for it. Before I get flamed. It's still a super cool build. Just expect a bit better from a featured car or a car going for records. JonathanW Most after market ECUs can run multiple batches of injectors (even the solder at home Megasquirt packages, I made one of those), and today a number of aftermarket suppliers can control Direct Injection (MoTec and Haltech for example). But the Japanese have the philosophy of holding onto traditions even when tuning cars, and one of those "traditions" is using fairly old, but proven electronics, like numerous different boxes that control one specific parameter at a time... while euro tuners at least like to route every bit of control through the same ECU. The HKS F-Con series one sees mentioned on this site pretty often still started production in around 2000, as far as I can see. I can't find any info on how often new versions of it are released. Yeah I've noticed that people are far more likely to use a collection of piggy back units, rather than go fully standalone. 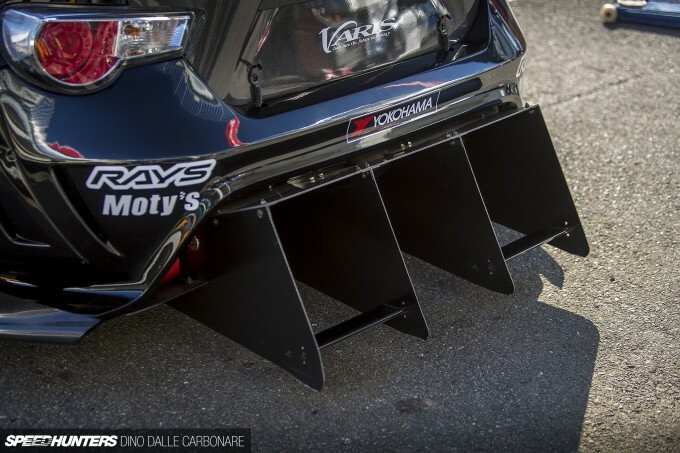 With the aero does the diffuser look a bit steep to you? Personally I'd think you want to use more of the width of the car, at a lower angle, but this is why in one of my other comments I'd love to see the development and decision making processes laid out. I would definitely try to use all of the width of the car for the diffuser. However the steepness of the diffuser is not an issue if flow is attached. If flow is attached it is beneficial to be steep with a large exit. The goal is too have a large diffuser exit to maximize the flow rate throught the diffuser. But it looks to be a simple shape and sheet metal where a much better diffuser could be designed if composites were used. It also seems to be a 'stick something on' type of aero philosiphy. The wing could be much better as well if designed from scratch rather than a bolt on wing (which looks mounted to the trunk lid). But while the diffuser seems like it will separate, but cannot say for sure with out seeing their CFD or wind tunnel data, the front bothers me the most. doing mostly open wheel stuff a large interest for me is cutting drag from the tires. Should be trivial on a close wheeled car. But you can see the tire isn't hidden and no real provisions to send the air out away from the front tire. And the front wheel well extrators aren't great. Other than that, if the car is going to me made wider with the front splitter/diffuser then I would add skirts and a wider wing. 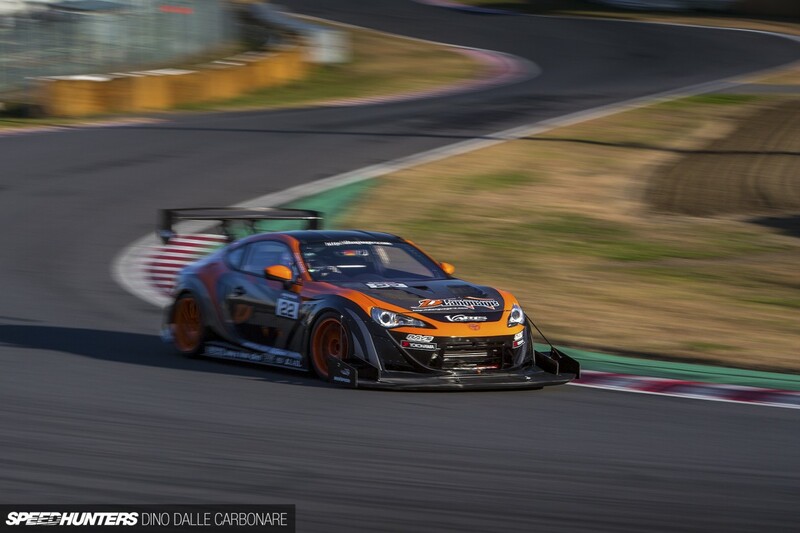 As far as tuning a full standalone would be expected as far as I'm concerned for a car going for records at Tsukuba. I like the car. The problem with building a direct injection engine is there are limited numbers of injectors to support higher horse power and that they don't run off of 12 volts a lot of direct injection injectors are 65 volt. And the other is the fuel flow from the high pressure pump to the injectors there's not to many aftermarket high pressure pumps. JonathanW Or if anything fails, pull out the direct injectors, put in blanks, and runs the car on custom port injection... just don't do it like that one japanese D1/Time Attack(?) team that build an IS-F and just left the injectors dead inside the cylinder while running ports .. couldn't believe a tuner could be that stupid. I'm assuming that this car makes about 600-700bhp, so drag is probably not that big a consideration. I've no idea how much time is on the table for drag reduction from covering the front tyres fully... Have you any data for a production based car? As for the rear wing, I've no idea how good the voltex aerofoils are, but with the mounting it's nice and high so I can't see any great problems with the placement. One thing we need to bear in mind is that time attack is still a million miles away from F1, and so a lot of aero stuff is just a first stab and it takes a long time to come back around to it being the weakest link and therefore top of the to-do-list when you have limited time and funds to develop, even with a sponsored shop build. JonathanW those injectors survive the engine's heat because the fuel flow cools them. Don't remember the exact details but the dead injectors broke apart and bounced the cylinder head to death. Blanks would have been a little cheaper. Wake up Nissan, this could be us but you playin'. 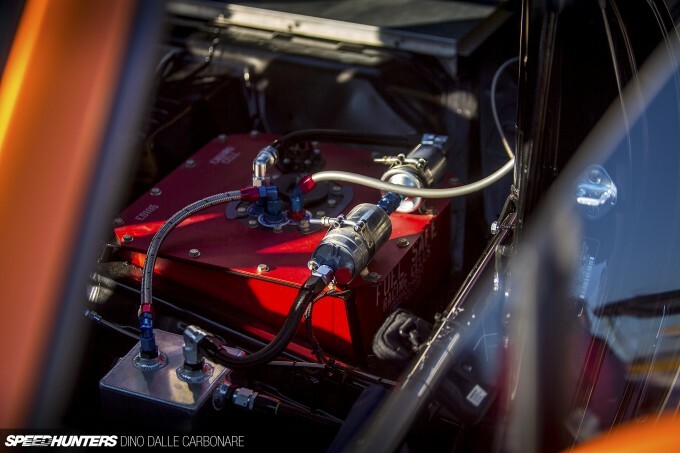 Nice coverage sir thank you - awesome to see some ZN6 love on the performance side of things. I wanted to see what kind of wheel / tire set up as well as it would have been nice to find out about their parts specs too.